It was a regular Wednesday for Ryan Bates. 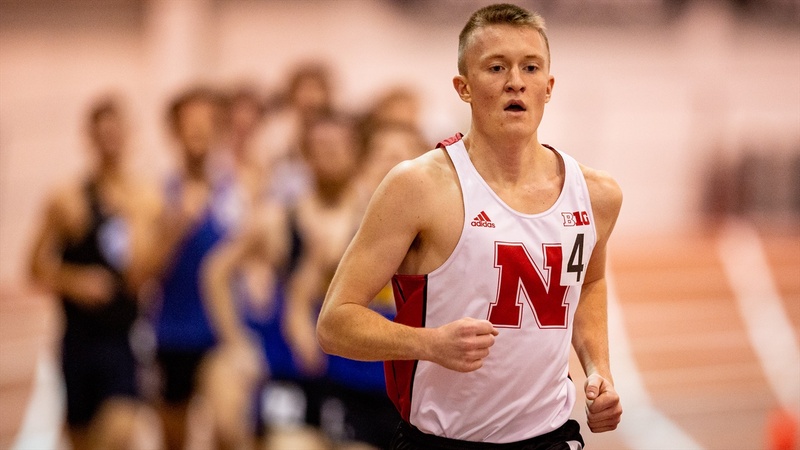 The junior distance runner for Nebraska was walking from ‘The Oasis’ (a fueling station located in the Hendricks Training Complex) to the weight room when something caught his eye out the big windows of the Bob Devaney Sports Complex. A little black dog — at least from what Bates could see — was running between the cars in the parking lot. He immediately knew it was out of place. Ryan Bates at a Nebraska indoor track and field meet. The high in Lincoln, Nebraska, that day was 26 degrees and there was snow on the ground, but Bates didn’t hesitate. Between the cars and the weather, he knew the dog needed to get inside immediately. Racing flats in hand, Bates headed outside in only compression shorts, a t-shirt and his long socks and shoes. He didn’t expect to be outside long. A few of Bates’ teammates joined him in the parking lot, chasing the dog in circles. As the dog grew more and more terrified of the situation, it finally took off running down the road that runs alongside Devaney toward the Salt Creek Levee Trail. Bates ditched the racing flats. “It was all instinctual for me where I just said, ‘OK, I’m going after this dog now,’” Bates said. “After I set down the shoes that were in my hand, I just took off after it. It was never a thought of should I or shouldn’t I. It was just no thought at all. Jill Styskal’s dog Mia loves to ride in the car. She can either be found in her lap or curled up under the console as she drops off and picks up her three children — Reid (13), Cody (10) and Lily (8) — from various practices and activities around Lincoln. It was no different on Wednesday, Jan. 23. With Lily at gymnastics practice at Mabel Lee Hall, Jill dropped Cody off for his gymnastics practice at Devaney. With only Reid in tow, Jill decided to treat the two to Heoya — a favorite Asian fusion restaurant about 10 minutes away. As they got closer to the restaurant — a trip slowed by Lincoln’s rush hour traffic — Jill had only one question. The 10-pound Shih-poo should have popped up to the sound of her name. She didn’t. Jill and Reid pulled over to the side of the road and looked around the minivan. They checked all the spots she may have been, but every spot turned up empty. Jill hadn’t seen Mia hop out this time, but she knew where she was. It had been close to 30 minutes since she had dropped off Cody though, so she was concerned about where Mia could have gone. Taking as many short cuts as the route allowed, Jill made it back to Devaney in five minutes. She called in reinforcements — Kris Hoffman and Natasha Chikina, who run Nebraska Dive Club — and the search was on. “I knew it was going to take a small miracle to find her,” Jill said. Jill had never owned a dog until Mia. Her kids had begged for years to get a dog and in December 2017, Jill and her husband decided it was time. The kids were old enough to help care for the dog. Within a matter of time, Mia found her way into the family’s hearts but especially Jill’s. She sleeps in bed with Jill and her husband, under an electric blanket. Jill jokes that Mia is now her favorite child. The thought of losing her was heartbreaking. She did her best to push the worst-case scenario thoughts from her mind, but it was difficult to do so. There were so many factors working against Mia from the weather to the cars and the creek nearby. By the time Jill and Reid returned to Devaney, Hoffman was already searching for Mia. Jill had come in the back way of the building near the walk-up ramp. That’s when she saw Bates. It wasn’t uncommon to see the runners outside training, but not on such a cold day and especially not in only shorts and a t-shirt. Before Jill could question what on earth this runner could be up to, she saw it: Mia’s head pop up from Bates’ arms. “That’s my baby,” Jill called from her car. Ryan Bates and Mia at the Devaney Center. Bates couldn’t stop. Mia’s curly black hair was full of snow and ice. Her body was shaking, and he had her pressed against his body as he ran. Bates told Jill to follow him. He knew he had to get her inside and knew exactly where to take her. As they approached Devaney, Reid hopped out of the car. Bates told him to come with him. They were headed for the training room in the Devaney. As Jill caught up with Bates and Reid, she found the two with Mia who was wrapped in towels. Bates’ arms were bright red, as were his cheeks. Mia was shivering. But both were safe. For that, Jill was immeasurably thankful. Bates, an engineering major from Lincoln, Nebraska, is not one to take too much credit. He’s quick to compliment others and describes himself as someone who is simply happy to do whatever is needed for his team and for others. “In every aspect of my life, I know how lucky I am to be in such a great place at the university, let alone an engineering student who has a lot of success in that, but lucky enough to be on the track team. I know how special that is, and especially being from Lincoln,” Bates said. “I know how many people would like to do that, and I know that they will never get the chance to do what I'm doing. I definitely take that with a lot of pride and I hold that very highly in every aspect of my life, and to know that I was able to give back and be a positive reflection of the university itself, it means so much. Ryan Bates with Reid, Cody and Lily. Nebraska hosted an indoor track and field meet at Devaney the weekend after Bates saved Mia. Jill and her family decided they would go, wanting to support the young man who already meant so much to them. The Styskals had the chance to meet Bates’ family, who they then spent nearly an hour and a half with on that Saturday talking. Jill and her family also had a chance to see Bates and thank him once again for what he did for them and Mia. Because Jill knows things could have been very different that Wednesday in January, but they weren’t because of a Nebraska distance runner named Ryan Bates. “I honestly believe it was a God thing,” Jill said. “If it had been anyone else, I don’t think it would have had the ending it did.